The DC Advocates for the Arts are fighting against the cuts in the local arts budget. Please sign the petition letter below, and ask your networks - artists and arts organization folk - to sign on. Even if you are not tagged in this note, please add your name, affiliation, and the ward(s) in which you work as a comment here [note - this is a Facebook petition - if you comment on Blog This Rock, we will forward to DC Advocates to the Arts] to add your name to this petition. The deadline for signatures is Thursday at 2pm. This is a NOW do this NOW kind of ask. On Saturday, July 25th, from 4- 7 p.m. there will be a rally in support of the Iranian people in Washington, D.C. The evening will begin with a protest at the UN offices in DC at 18th and K NW, will continue with a march past the White House, and will end at the National Mall between 4th and 7th for rally. "[The rally will show] support of the Iranian people and in condemnation of the human rights abuses being committed by the Iranian government. 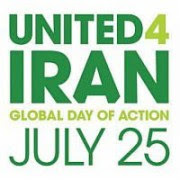 United4Iran does not promote any political agenda; our only aim is to support the people of Iran in their struggle for democracy, freedom and basic human rights." For more information, including contact info, please go to the event page. Next week, PEN will be in court challenging the U.S. government’s massive warrantless surveillance program. We believe our own communications, which include sensitive phone calls and e-mails with writers at risk around the world, are vulnerable under the program. And we know, based on the experiences of our colleagues in countries where governments had unchecked surveillance powers (including the United States as recently as the 1970s), that programs that allow governments to spy on their own citizens are often directed against writers and intellectuals, and that domestic surveillance in general poses a serious threat to the intellectual and creative freedoms of all citizens. The hearing will take place next Wednesday at 10:00 a.m. in U.S. District Court in New York. It comes amid new revelations that the National Security Agency’s telephone and Internet surveillance program has been collecting the private communications of Americans in clear violation of longstanding legal limits on such domestic surveillance activity. The NSA program was implemented in secret by the Bush Administration late in 2001 and its scope remains unknown, though concerns about its legality have surfaced repeatedly. In 2004, then-Attorney General John Ashcroft and other senior Justice Department officials refused to provide the legal certification necessary for reauthorization of the program, believing it was violating the rights of ordinary Americans. Last year, in a tacit acknowledgment that elements of the program were illegal, Congress passed the FISA Amendments Act, which granted immunity to telecommunications companies for participating in the NSA program and supposedly authorized its controversial aspects. Next week’s hearing is the first in a suit challenging the constitutionality of the FISA Amendments Act; meanwhile, ongoing Congressional investigations have uncovered information suggesting that the NSA is scrutinizing e-mails on a scale that may even violate the FISA Amendments Act.The Bush Administration, Congress, and now the Obama Administration insist that the powers are necessary to protect the country from individuals and groups that threaten national security. In fact, the laws that the NSA program and other post-9/11 surveillance powers circumvent were specifically crafted to ensure the U.S. government can spy on suspected terrorists and other foreign threats. What those laws also guaranteed, however, was that the constitutional right of American citizens and residents to be secure against unreasonable searches was protected. History has repeatedly shown how, without such protections, surveillance in the name of national security often extends to spying on peaceful political activists, journalists and writers, and other ordinary, law-abiding citizens. As part of our Campaign for Core Freedoms, PEN has been challenging a range of post-9/11 surveillance powers that threaten the right of our members, and all American citizens and residents, to read, write, and communicate freely, without fearing that our government is listening in or compiling private, First Amendment-protected information. We have been fighting to restore confidentiality protections for bookstore and library records and curb the ability of the FBI to use National Security Letters to gain sensitive personal information. We have made progress—but there is still work to be done to ensure that only those who are suspected of involvement in terrorism or other criminal activities are targeted. Watch for information from PEN and from the Campaign for Reader Privacy in the coming days about what you can do to help us rein in excessive surveillance powers. Please visit PEN's resource page for information on NSA surveillance, the FISA Amendments Act, and how to take action. Features Venus Thrash and Split This Rock's very own Sarah Browning (pictured). Bring your love and your poems for the open mic. Venus Thrash's poetry has been published in Gargoyle, Folio, Gathering Ground, Beltway Quarterly, Torch, Haunted Voices, Haunting Places: An Anthology of Writers of the Old and New South, and the Arkansas Review. She has read at the Studio Museum in Harlem, The Schomburg Center for African American Research, and The Library of Congress. She is a Cave Canem and Soul Mountain Fellow. She is an adjunct Professor of English at Trinity College. Sarah Browning is Co-Director of Split This Rock, author of Whiskey in the Garden of Eden (The Word Works, 2007), and co-editor of D.C. Poets Against the War: An Anthology (Argonne House Press, 2004). She has worked as a community organizer for Boston public housing and as a political organizer for reproductive rights, gay rights, and electoral reform, and against poverty, South African apartheid, and U.S. militarism. She has written essays and interviewed poets and artists for a variety of publications. Hosted by Katy Richey and Melissa Tuckey. Sunday Kind of Love happens the 3rd Sunday of every month in the Langston Room at Busboys & Poets, 14th Street NW (V & 14th Streets NW, U Street/Cardozo metro). Sponsored by Busboys and Poets and Split This Rock Poetry Festival, with support from the DC Commission on the Arts & Humanities. Check out this new blog for writing prompts: The Poetry Instigator at www.writingprompts.org. Lucy Biederman and Eleanor Tipton, two George Mason University graduate students, created this new blog that we think you'll be interested in. On July 20, we're launching a four week SUMMER JOURNALS CHALLENGE, for which we're collaborating with four awesome national literary journals to bring you four weeks of cool prompts, literary discussions, special features, and more. Each of the four weeks, an editor from one of the featured journals will read the poems based on the week's prompt & choose a winner, who will receive a free year's subscription to the journal, not to mention bragging rights! *Visit us on Facebook, become a fan, and/or update your status with our website to help us advertise! Our Judge this year is poet and translator Kevin Bowen who will also present the award. No entry fee is required and the entry deadline is September 1, 2009. For more information, please visit www.CONSEQUENCEmagazine.org. Those are the last three entries on Poet Mark Nowak’s blog, Coal Mountain. In this blog, which shares the name of his most recent book of poems, Nowak posts stories of the devastating human consequences of the mining industry and its practices, stories not often found in the mainstream media. Nowak’s ongoing work to keep the stories of mining deaths at the forefront of his readers’ minds demonstrates the urgency with which these issues need to be addressed; constantly reminding us that there are lives of real people at stake as well as environmental, economic and political costs to mining. Nowak translates the resolve of his daily activism on behalf of working people into art in all three of his books of poetry, Shut Up, Shut Down, Revenants, and his most recent book, Coal Mountain Elementary. Deceptively simple, Coal Mountain Elementary combines photographs, newspaper articles, eyewitness testimony, and parts of an elementary school curriculum to relay the human consequences of coal mining. The book reveals how people across the globe are daily dehumanized to support an unsustainable level of consumption. Nowak’s poetry lies in the arrangement of the book as whole – fragments of testimony demand that we witness the devastation of human life in the interest of mining and profit. “And I thought we was getting covered up with a roof fall at first. I said, oh no, I’m going to get covered up in a mantrip, buried alive here.” The next page indicates that two class periods will be necessary for the making of coal flowers. The way Tang is treated by the police – voiceless, powerless – and the way the press amplifies her voice exemplifies the effect of Coal Mountain Elementary on the reader. Tossed between photographic evidence of working conditions, the voices of the Sago miners, and the newspaper accounts, the children’s curriculum becomes increasingly poignant, as the lessons move from craft, to "mining" a cookie for its chocolate chips to explore costs (labor is not included other than with a price tag), to writing a short story about life in a mining town. This intertextuality is both the art and the power of the book – the story of Sago unfolds in such a way that is impossible to separate from the unrelenting onslaught of the accounts of deaths in Chinese mines. Nowak interweaves the four elements expertly, leaving us no choice but to face the consequences of our consumption and our failing policies. Buy this book at Coffee House Press. The Writer’s Center, established in 1976, is one of the nation’s oldest and largest literary centers. It provides over 60 free public events and more than 200 writing workshops each year, sells one of the largest selections of literary magazines in its on-site bookstore, and publishes Poet Lore, America’s oldest continually published poetry journal. The Writer’s Center, metropolitan DC’s community gathering place for writers and readers, is currently accepting submissions for several competitive Emerging Writer Fellowships. Emerging Writer Fellows will be selected from applicants who have published up to 2 book-length works of prose and up to 3 book-length works of poetry. We welcome submissions from writers of any genre, background, or experience. Emerging Writer Fellows will be featured at The Writer’s Center as part of their Emerging Writers Reading Series. The readings, held on Friday evenings, bring together writers in different genres with a backdrop of live music. The Writer’s Center book store will sell titles by the Emerging Writers throughout the season in which they appear in an effort to promote them and their work to a wide audience. Their events will be held in September, October, and December. See events calendar for more information. The Writer’s Center seeks promising writers earning less than $25,000 annually to apply for our Undiscovered Voices Fellowship. This fellowship program will provide complimentary writing workshops to the selected applicant for a period of one year, but not to exceed 8 workshops in that year. We expect the selected fellow will use the year to make progress toward a completed manuscript of publishable work. The Writer’s Center believes writers of all backgrounds and experiences should have an opportunity to devote time and energy toward the perfection of their craft. The selected fellow will be able to attend writing workshops offered by The Writer’s Center free of charge. In addition, the fellow will give a reading from his or her work at the close of the fellowship period (June 2010) and will be invited to speak with local high school students on the craft of writing. a) a cover letter signed by the candidate that contains the statement: “I understand and confirm I meet all eligibility requirements of the Undiscovered Voices Fellowship.” The cover letter should include information on the impact this fellowship would have on the candidate. These items should be sent in hard copy to The Writer’s Center, Attn: Undiscovered Voices Fellowship, 4508 Walsh St, Bethesda MD 20815. The deadline is September 15, 2009.